Born, Giovan Battista di Jacopo, and trained under the Florentine masters, Andrea del Sarto (1486 – 1531) and Pontormo (1494 – 1557), Fiorentino gained the nickname, Il Rosso for his bright red hair. He worked in the influence of the Florentine School of painting, and was largely responsible for introducing that style to France as part of the School of Fontainebleau. In 1527, the Holy Roman Emperor, Charles V, caused great distress in his imperial Sack of Rome, forcing Il Rosso to flee to France. This is where he was patronized by François I, who revitalized the royal Château de Fontainebleau by inviting artist and architects in decorating the new structure. Il Rosso worked with other Italians such as Francesco Primaticcio (1505 – 1570), forming the influential First School of Fontainebleau. He spent most of his life working in the Château de Fontainebleau, but his greatest work is often considered that done in Volterra in Tuscany. In the city’s main Duomo (Cathedral) he painted his powerful altarpiece, the Deposition or Descent from the Cross. Another of his well known works is the equally powerful, Moses Defending the Daughters of Jethro, now at the Uffizi Gallery along with his endearing pieces, Musical Angel and Portrait of Young Girl. 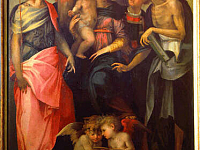 Also in the Uffizi Gallery is his expressive work, Madonna and Child with Saint; which shows his typical gaunt depictions in figures.